Zorb It-Up! is a unique encapsulating powder that quickly turns any liquid into a solid gel for faster and easier clean-up. It solidifies spills in seconds to prevent a larger mess from occurring and contains an odor counteractant to treat any odors caused by the accident. Safe for use on hardwood flooring, tile, marble, laminate, and even carpet! Zorb-It-Up! Amazing Absorbent Sheets make light work of cleaning up wet messes. Our amazing sheets use the Zorb-It-Up! liquid-to-gel technology to absorb incredible amounts of urine, vomit, or any other water-based fluids after any accident. Zorb-It-Up! 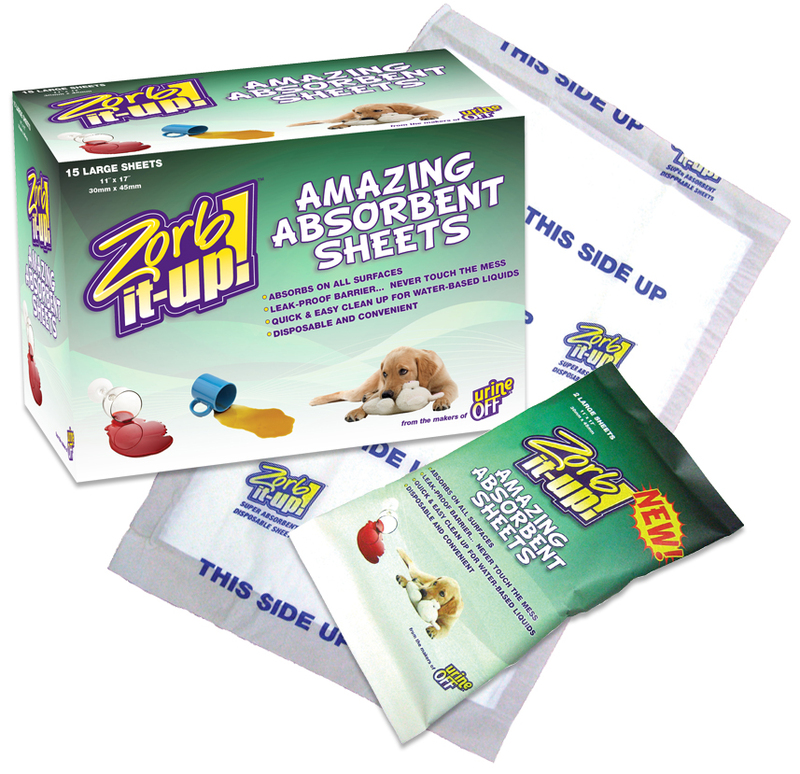 Amazing Absorbent Sheets are available in a 15-count box or a 2-count pack for your convenience. Zorb It-Up! is a unique encapsulating powder which quickly turns liquid into a solid gel for faster and easier clean-up. It solidifies spills in minutes to prevent a larger mess from occurring, and contains an odour counteractant to eliminate any odours caused by the accident. Safe for use on hardwood flooring, tile, marble, laminate, and other surfaces.